Thank you very much for your continued cooperation and work for the WABIP. Last year was a very productive year for our organization, and we are hoping to keep the momentum and much more. 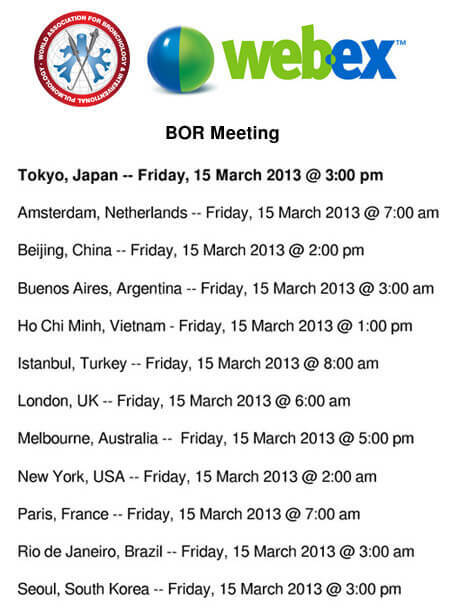 As such, we would like to hold the first 2013 BOR meeting on March 15th. Signing-up for a WebEx account is not required; we will simply set the meeting up and you’ll receive a separate invitation email from WebEx 2 days prior to this event. Once the meeting is about to start, please click “Join” in the email from WebEx and then type your name and address to enter the virtual meeting room. There are a number of issues which need BOR consultation. Therefore, it is crucial we have full attendance. For those of you unable to attend, please nominate a Proxy who can attend on your behalf, and notify me as soon as possible using the MS word template I will send to you by email.